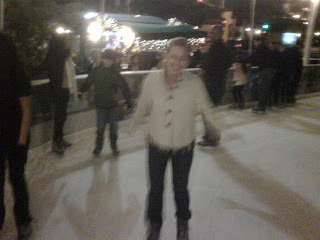 when my bff suggested going ice skating in santa monica the other day, i was scared. i mean... ice = hard+wet+cold and since i didn't even see snow until i was about 14, very unfamiliar. but, why start the new year off with irrational fears dictating things? it was rad and i didn't fall once... although i'm seriously close in this pic. ice-skating by the beach is so "cool." I haven't done that in so long. I might go this weekend now after seeing your post. I think after 10 minutes I'd be done! wait a minute, a NEON museum? i just look at the pictures.